Specifications: blades 22" or 24" notched or smooth on 9" spacing, cast iron spools, 1 1/8" hi-carbon steel gang rods, dual 7.60 x 15 6-ply tires on 15" x 5 1/2" 6-bolt wheels, 5000 lb. rated hubs with dual grease seals and a grease barrier, slip-in spindles with wear sleeves, 3" x 12" hydraulic lift cylinder, 3" x 3" heavy wall tubular frame, gang angling from 12 to 28 degrees, triple sealed trunion mounted gang bearings, heavy duty axle shaft with four (4) regreaseable bearings. Sizes: 10 widths from 10'10" to 16'11". Weights: 3036 to 3910 pounds. 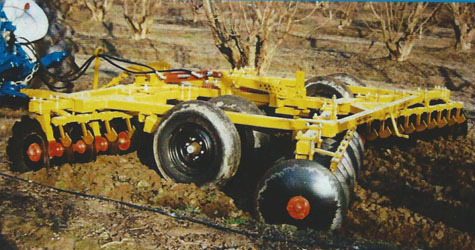 Features: A medium duty wheel-controlled tandem disk with easy crank adjustment for rear gangs, relocating pins to adjust front gangs, and front mounted turnbuckle to level the machine.